Make the meeting announcement warm and inviting. When appropriate, invite families personally. Make it clear that you are not asking for any commitment. You simply want to hear from your families about their lives so that you can glean ideas. Consider how wide to open the circle. Some families will be comfortable identifying with disability while others will not. 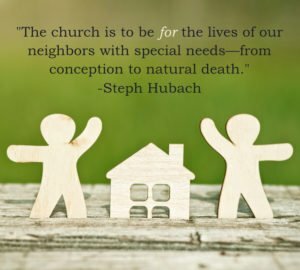 If you want to include families may not typically be associated with a disability ministry, specifically address them in the invitation. See the example below. Provide childcare and activities for older kids and teens. 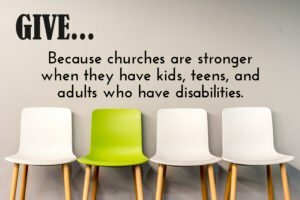 When possible, offer activities for kids with disabilities and their siblings at the church (or wherever the meeting is held). You want to make it as easy as possible for parents and caregivers to attend the meeting. Activities can be as simple as playground time, games, crafts, or a movie with popcorn. Carefully plan the meeting agenda. Include a big-picture vision for ministry and where you ultimately want to be as a church. Be honest about the realities of where the church is currently. The more honest you are, the more open your families are likely to be. Encourage families to share both ver writing. Some families will not feel comfortable sharing out loud, so have a brief questionnaire that they can fill out if they want. Encourage them to give you additional information or thoughts that they have later. If you or someone in your family has a disability, our church would love to get to know you more! We are hosting an interest meeting so we may learn more about your family and ways our church can come alongside you for care, encouragement, and discipleship. 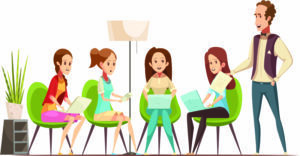 This meeting is for people of all ages and with any disabling condition, including learning disabilities, families with mental health diagnoses, and the elderly. Our only objective is to get to know you better so that we can more effectively plan our upcoming year of disability ministry at [church name]. To register or reserve childcare (birth to age 15), email us at [email address]. Would you like to hear how other churches have conducted interest meetings? 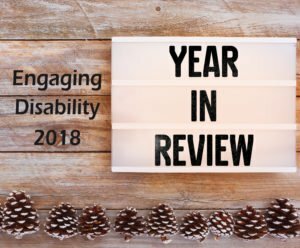 Contact us at engagingdisability@pcanet.org. As 2018 draws to a close, we would like to share many areas of ministry that this past year included. We conducted 173 consultations with families and congregations plus 17 onsite consultations with churches. We presented and exhibited at 4 conferences held by The Gospel Coalition, CDM’s ONE Women’s Ministry, and CDM’s ESTABLISHED Children’s Ministry. We presented 7 training workshops at conferences. We made 9 presentations at PCA churches. We made 2 presentations at PCA presbyteries. Registrations came from churches and families in 28 states and 5 nations. Participants included pastors, elders, deacons, church staff, church members, volunteers, parents, people with disabilities, and caregivers. We were able to do all these things because of the generous giving of churches, organizations, and individuals throughout 2018. Engaging Disability With The Gospel is entirely funded by contributions from people just like you. We are very close to reaching our financial goal for 2019 which will enable us to expand ministry with churches and come alongside even more families touched by disability. Would you consider investing in Engaging Disability With The Gospel? 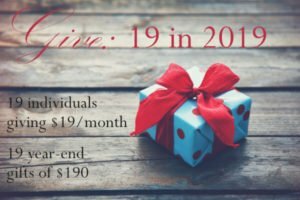 We need 12 individuals to contribute $19 per month in 2019. We need 5 one-time gifts of $190 before year-end. provide adaptations and accommodations to make discipleship and growth in Christ a reality for our friends whose lives are impacted by disability. Your partnership will enable us to engage disability with the gospel across 1,900+ PCA churches. Many thanks and wishing you a Happy New Year! One Christmas Day, our youngest son Timmy (who has Down syndrome) eagerly opened a Christmas present. As the wrapping came off and he began to read the front of the box, his shoulders slumped. Shaking his head, he just sat there—thoroughly deflated. “It’s crap,” he stated. We all cocked our heads and looked at him with confusion. He held up the opening to the top of the package and raised his voice, “It’s crap! I got crap!” Again, we all exchanged mystified looks. What are the disappointments in your life right now? No matter where they fall on the spectrum of depth and intensity—how are you contending with them? Maybe you expected a promotion and just found out that you didn’t receive it. Maybe your daughter is engaged and your son-in-law-to-be is not even remotely the type of man you had envisioned for her. Maybe your church just seems to be fracturing over ongoing petty disagreements—and you feel disillusioned by that. Maybe you’re still single and deeply wish that you were married. Maybe you are married and have recently been blindsided by an unexpected divorce you never wanted. Maybe you are reeling from the shock of a diagnosis of permanent disability for a family member. Maybe you’re having to come to terms with the reoccurrence of your cancer—again. In a sermon recently, my pastor shared this quote by counselor Sharon Hersh: “Your quality of life is determined by how you live when you don’t get what you want.”  How are you living in the face of your disappointments? Are you binging on food or alcohol? Do you check out with the Hallmark movie channel or endless episodes of your favorite show on Netflix? Do you numb yourself as you scroll endlessly on your phone, spending hours on Instagram or Facebook? Do you try to fill your life with empty substitutes for your losses, hopping from one frantic activity to the next? Have you stopped wanting anything so that you don’t need to feel disappointed again? Are you harboring resentment towards those who have received what you did not? Have you shut off your heart to God and others and are marinating in your own chronic sorrow? Are you in super-assertive mode, attempting to control everything around you so that you will never be subject to such pain again? In Philippians 3 Paul writes, “I press on to make it (the prize of the upward call of God in Christ Jesus) my own, because Christ Jesus has made me his own.” Have you ever thought of that truth as being central to how you process everything in life? The starting place is that “Christ Jesus has made me his own” and because of that, we press on to make him our own. Let that sink in—to the core of your soul. When that truth is the center of our understanding, at the very fabric of our being, it changes how we live out the processing of our experiences. But, how exactly does the truth that Christ Jesus has made us his own relate to how we process disappointments in life? First, when we belong to Christ—and experience our life in union with him—we have a Savior and Brother and Friend who knows what it is to live with disappointment. Colossians 1:16 states, “For by him all things were created, in heaven and on earth, visible and invisible, whether thrones or dominions or rulers or authorities—all things were created through him and for him.” Have you ever wondered what the experience of the incarnation was like for Jesus? If Christ is also our Creator—what was it like to enter this beautiful world of his Creation, now broken with all the ramifications of the fall on display in every area of life and in every human relationship he encountered? Every. Single. Relationship. That had to be so difficult—and a constant source of unmet desire accompanied by human feelings of disappointment. His desire for us is a life of image-bearing that reflects and honors him and blesses the world around us. Was this, in part, one aspect of his earthly experience as the “man of sorrows?” Jesus, who has made us his own, is not a stranger to disappointment. We can take comfort in his identification with us. Second, there are some commonalities between Jesus and Paul Harvey. (If you’re a millennial, you may have no idea what I’m talking about!) Paul Harvey was a radio commentator who had a short daily show called “The Rest of the Story.” Each day, he’d tell a tale that left his audience thinking that one thing was going to happen, only to reveal information at the end that told “the rest of the story.” It was all about the “ah-hah” moment. 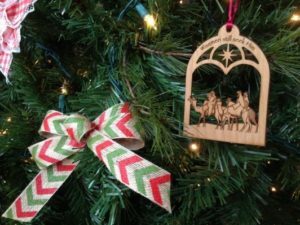 Jesus has already written the story of your life—and he can’t wait to show you “the rest of the story.” Like Timmy, it is possible for us to pull off part of the wrapping paper of our life’s story and be deeply disappointed by what we think we see. Sometimes we haven’t got the eyes of faith to read the words of our situation for what they are really saying. 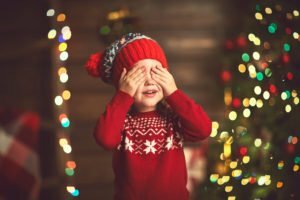 Many parents who have children who are born with disabilities struggle navigating the co-existence of two truths: 1) that their expectations of giving birth to a “typical child” have not been met, and 2) that the child who is packaged in unexpected ways is an authentic gift whose story—full of a different kind of potential—has yet to be told. Christ, who has made us his own, calls us to trust him as the Author of our stories. Finally, Christ is not only Creator and Author, he is our Transformer. The night before my husband Fred and I were married, all our luggage was stolen from our cars while we were attending our rehearsal dinner. At the wedding the next day, our pastor gave a wonderful homily on Jesus’ first miracle at the wedding at Cana. He reminded us that Jesus turns water into wine—taking the disappointments of life and transforming them into something beautiful. That wise counsel has been immensely helpful throughout our lives. Christ, who has made us his own, calls us to have faith in him to bring his transforming power to bear in our lives. To turn our water into wine. To take our crestfallen-laden experiences and bring glory to his name and good to our lives through them. “Your quality of life is determined by how you live when you don’t get what you want.” How will you live differently today amid your disappointments in life? Christ has already made you his own. Let that truth saturate your heart. As your Creator who became incarnate, he has walked in disappointment like you have. As the Author of your story, he knows how it ends—he knows “the rest of the story.” And as the Transformer of your life, he has the ability and the will to turn your water into wine. Christ has made you his own. Identify with him. Trust him with your story. And have faith in his transforming power. That is how you make him your own, in grateful response. This post appeared first on enCourage. Reprinted with the permission of Stephanie Hubach and enCourage.